There are two types of people in the workplace: amateurs and professionals. Amateurs play small; they are constantly in “protect” mode . Amateurs whine, belittle, gossip. Amateurs see things only from their perspective. Professionals play at a whole different level. The hallmark of true professionals is that they don’t rely solely on their technical expertise for greatness. Professionals take their game to a higher level by connecting meaningfully with others. 1. Admit when they screw up. 2. Accept compliments and apologies with equal ease. 3. Know the difference between “personal” and “private” when it comes to sharing. 4. Know how to apologize and do so when needed. 6. Control the impulse to reply to snarky comments. 7. Avoid gossip, jumping to conclusions and placing blame. 8. Manage the tension between cutting people slack and holding them accountable. 9. Care about people, process and profit in equal measure. 11. Know when to shut up. We are all, in any given moment at work, capable of being an amateur or a professional. At which level are you choosing to play? 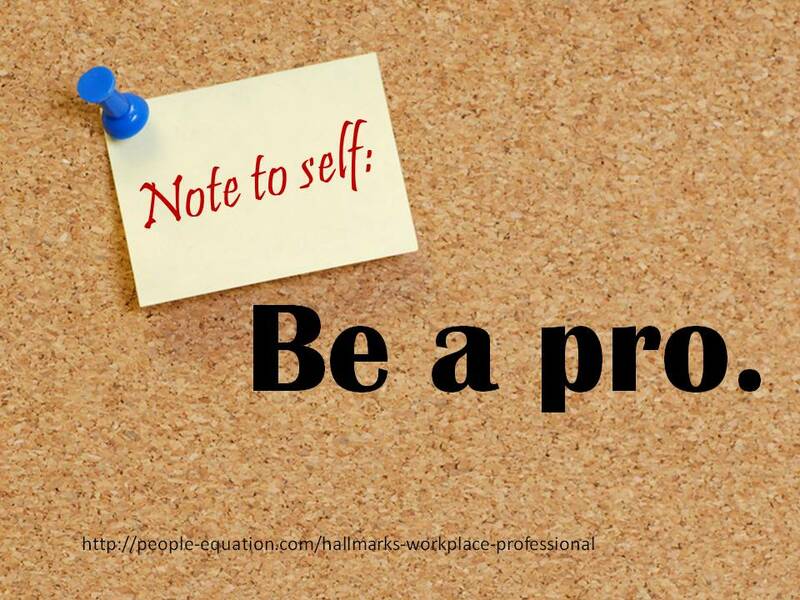 Question – what would you add to the list of things that a workplace professional does? How true! Yet another example of when titles just don’t matter. Your observation has me wondering. . . have you encountered people with high-level titles who think they are automatically conferred with “professional” status? “My title entitles me to behave selfishly or badly” – yep, I’ve met more than my share of those folks. Previous post: Will It Be a Good Day for You Today? Next post: Taking Action at Work – Go Now or Wait?